There’s more to radiant skin than cleansing, toning and slapping on the odd bit of moisturiser. With the right nutrients you can keep your skin strong, supple and spot-free, so take your pick and enhance your outer glow. Why is it that some people never have breakouts, while others have skin that reveals every internal indulgence, crisis, or imbalance? When the fact that you’ve had that big birthday celebration, added stress at work, or are simply premenstrual literally hits you in the face each time you glance in the mirror. One of the main reasons for these external signs is that your skin is an eternally busy, multi-tasking organ. Working as a first-line defence system operating a strict good guys in/bad guys out policy? Check. Homeostatically maintaining our body temperature through sweating or shivering? Check. Synthesising vitamin D while simultaneously protecting us from the sun’s harmful UVA and UVB rays? Check. Doubling up as an organ of detoxification when our poor liver gets a bit overworked? Check. With all this activity, no wonder skin sometimes needs some extra love and attention! 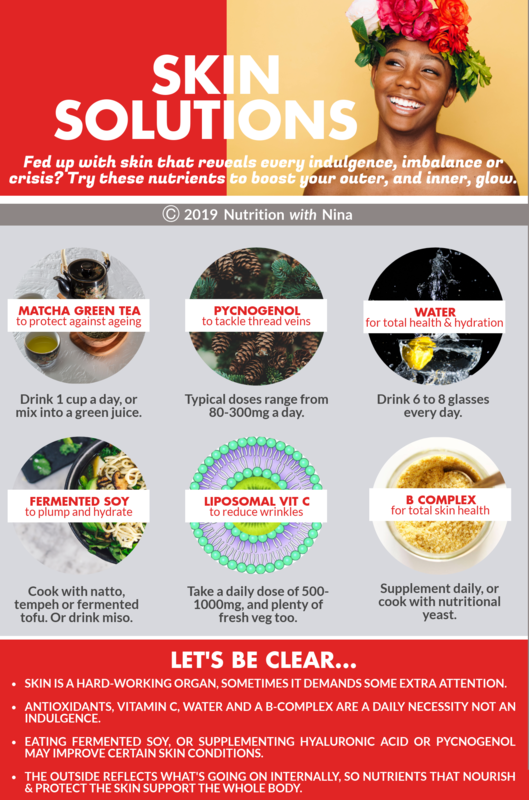 In fact, I think the health of our skin gives a pretty good indication of what is happening internally, sending out some useful cues as to what our body actually needs. If your skin needs help to be more supple, moisturised, resilient or protected, then chances are the rest of you does too. Check out these SKIN SOLUTIONS to boost your outer (and inner) glow. Is it a beverage, ingredient or supplement? Who cares! This potent, powdered green tea is packed full of skin-loving antioxidants, protecting against the ageing, oxidative damage caused by the sun, smoking and life in general. TIP: Drink a cup a day. You’ll typically whisk a 1/4tsp into almost-boiling water, but I often let it take centre stage in my Green Goddess Smoothie, a fruity blend of matcha, avocado, pineapple and fresh lime. If you’re prone to redness, thread veins or hyper-pigmentation, then it’s time to think small and focus on the capillaries. Pycnogenol, an extract from the bark of the French Maritime Pine tree may hold the key. It has antioxidant, anti-inflammatory and collagen-protecting properties. Even better it helps strengthen the tiniest of blood vessels, making it a fab supplement to tackle broken veins or hyper-pigmentation. TIP: Typical doses are between 80 to 300mg per day. CAUTION: Pycnogenol can stimulate the immune system, which means it is not a good supplement to take if you have an autoimmune disease like lupus, rheumatoid arthritis or MS.
They’re often overlooked, but together this group of vitamins contributes to the maintenance of healthy skin. 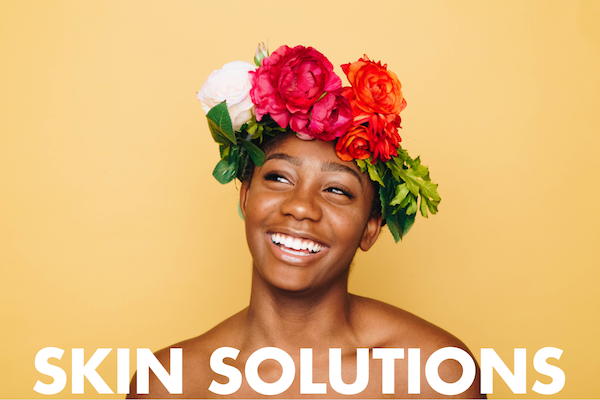 For instance: B1 (thiamin) is great as an antioxidant and for hypersensitive skin; B2 (riboflavin) balances mucus production and may be useful for acne-prone skin; B3 (niacin) works as an all-round skin conditioner – tackling rosacea, acne, eczema, and dryness too. Whizzing through to B12 (cobalamin) you’ll find preventing dark spots and hyper-pigmentation on the list. TIP: A daily dose of a B complex delivers them all. Opt for a methylated form, or a supplement derived from whole foods, to maximise absorption. Alternatively, cook with nutritional yeast – a natural vegan source of B complex which brings a nutty, cheesy, subtly umami flavour to your food. It might sound strange, but eating more stir fries could be great for your complexion, especially if they contain tempeh, soy or natto. Fermented soy products encourage the production of hyaluronic acid, a moisture-attracting molecule that helps plump out your skin. In fact, hyaluronic acid works both externally and internally – in face creams it attracts water from the air creating an extra barrier of moisture, in supplements it helps maintain hydration of cells, and joints too for that matter. TIP: Have 1-2 servings of FERMENTED soy products a week, as tempeh, tofu, natto or miso soup. I love new technologies! We already know that vitamin C is an amazing antioxidant and an essential catalyst for collagen production. Now you can get an intensive boost with liposomal vitamin C, a new formulation which wraps water-soluble vitamin C in a fat-soluble phospholipid coating. Imagine you’re in a crowded room, bringing a drink to a thirsty friend. You have 2 options as to how you can carry some water, either on a plate or in a bottle. It’s clear to see the bottle is a better transportation system. It will also deliver more too – less chance of spills than if you’re drinking from a saucer. You can even put the top back on and drink the rest a few hours later. No way would I return to that open plate of water. In the same way, liposome technology enables a slower and more sustained nutrient release. In general, liposomes make it easier for a nutrient to slip into your cells. In this instance bioavailability increases to a whopping 90-95%, a vast improvement on the 50% absorption you get with regular vitamin C.
TIP: Opt for between 500 – 1000mg a day, and top up with plenty of fresh vegetables and fruit. I couldn’t finish without mentioning water. We all know the drill – drink 6 to 8 glasses a day. But do you actually do that? If not, now’s the time to set several reminders on your phone, watch, fitbit – anything will do, just as long as you remember to drink a small glass each time you’re prompted. Drink enough water to support cell activities of digestion, circulation, absorption and excretion, and your skin will glow with thanks. TIP: Set your reminders and drink 6 to 8 glasses every day.